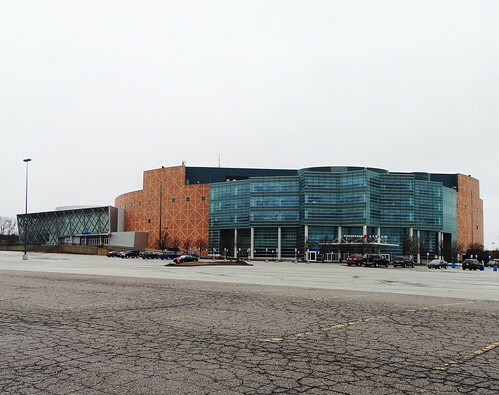 In 1988 a brand new, state-of-the-art arena was built in Auburn Hills; businessman Bill Davidson spent $90 million, entirely paid for with private funding, building a new, permanent home for the red-hot Detroit Pistons. 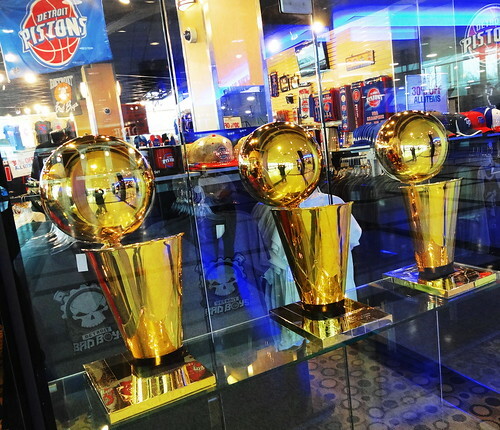 In turn the Detroit Pistons rewarded him with their first NBA championship in the 1988/89 season, they followed that up with a second, consecutive championship in the 1989/90 season. The third one took a while, it came along in the 2003/04 season. 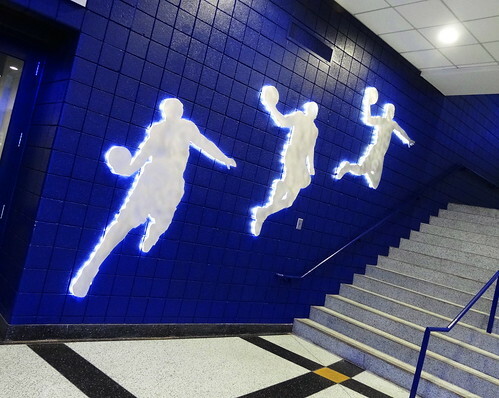 Mr. Davidson passed away, then in 2011 Tom Gores and Platinum Equity became the principal owner of the Pistons and Palace Sports and Entertainment. 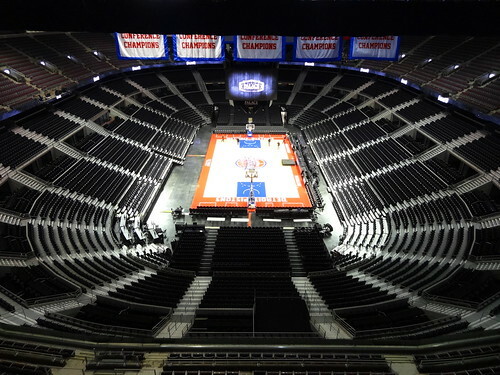 The Pistons final regular season game at the Palace will be played April 10, 2017, the 2017/18 season will be played at their new home, Little Caesars Arena in Downtown Detroit. 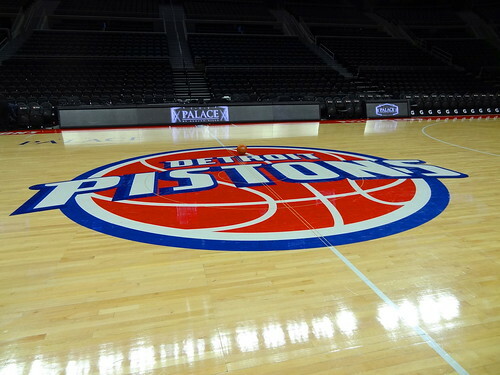 We’re at the Palace for a tour, we have great memories of this place; we’ve seen dozens of Piston games with friends and family, Kris was here for the ’04 Championship game, he and I watched as the Detroit Shock won their first (of 3) title–those were good times. 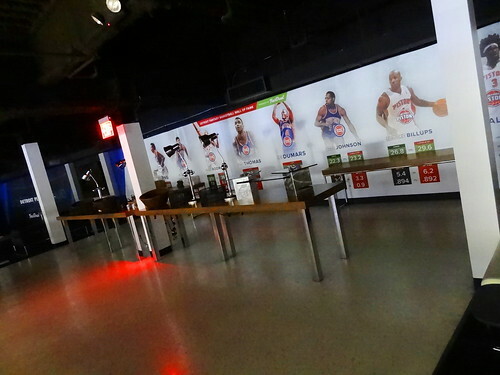 We’re in the 117′ tall Dodge Atrium, to the left replicas of the Pistons 3 Championship trophies are encased in glass, our guide is here and she’s ready to go. Our guide explains the Palace is an all-encompassing entertainment venue hosting concerts, family shows and sporting events; did you know Sting was the first musical act to perform here? 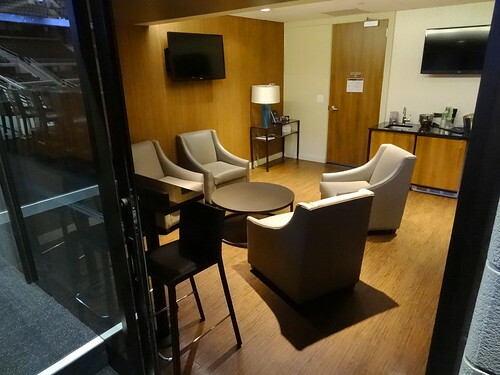 The first stop we make is a suite reserved for performers and family members of players; lots of room to stretch out and make yourself at home. 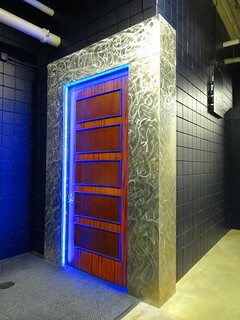 We pass Hooper’s cannon as we make our way to the Piston’s locker room, the oversize door is illuminated in blue LED light. 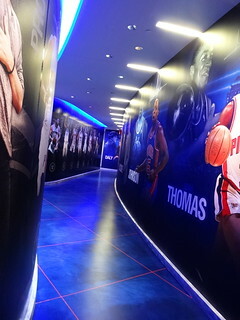 We’re in a long hallway, pictures of current team members and legendary players cover the walls, we slide into the locker room for a peek. 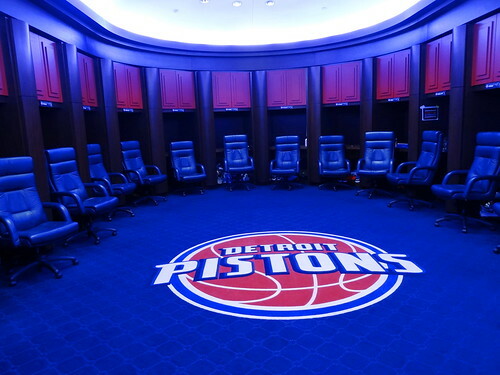 The Pistons logo is front and center on the floor, comfy-looking chairs rest in front of each roomy locker, the white board the coach uses is a clean slate. Player’s shoes are on the floor, I can’t resist comparing mine to theirs, I laugh, my foot is completely dwarfed by the size 22. 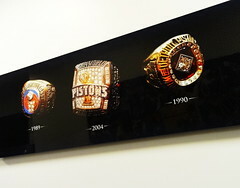 Further on, a photo captures each of the team’s championship rings, that’s some good-looking jewelry. The next room is home to a hot tub and massage tables, the last room in this area is the player’s lounge. 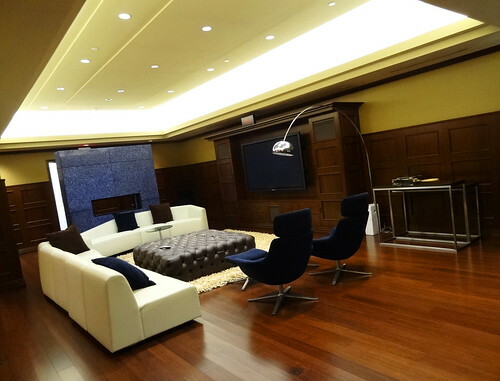 This is where the players hang out, the space is handsome, masculine; dark wood covers the floors and walls, sleek furniture, a gorgeous two-sided fireplace and a humongous flat-screen TV fill the room, very nice. On to the hardwood… There’s something really cool about standing on the actual playing surface of a professional sports team, looking around, the floor seems so small, the 3-point line so close to the basket, it’s like some kind of optical illusion. The floor is laid in sections, I can see how the pieces fit together. This is where it all happens; games are won and lost, trophies are held high in the air, fantastic plays are captured to be shown later on ESPN. 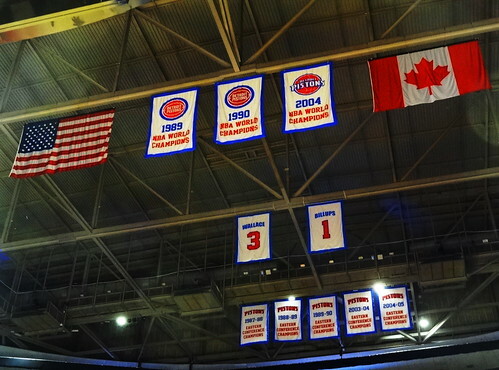 Championship banners and retired jersey’s hang high above the court, American and Canadian flags join the group. The Palace 360 scoreboard was installed in 2014. 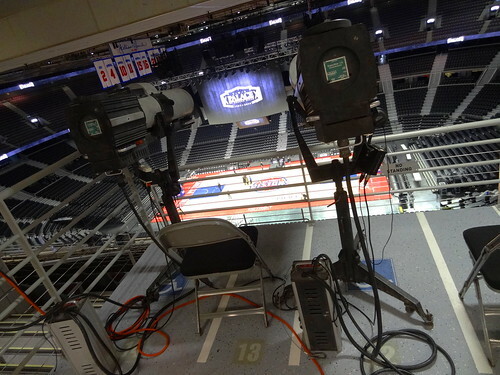 Looking out, the arena feels vast, LED ribbon boards encircle the lower and upper level. 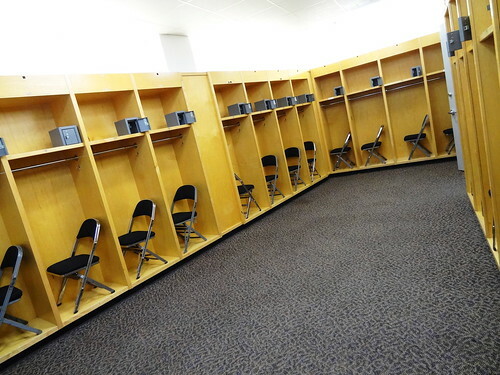 The visitor’s locker room is comparably laughable to the home team’s; plain, bare, open wood lockers and folding chairs– I’m sure some high schools have nicer locker rooms! 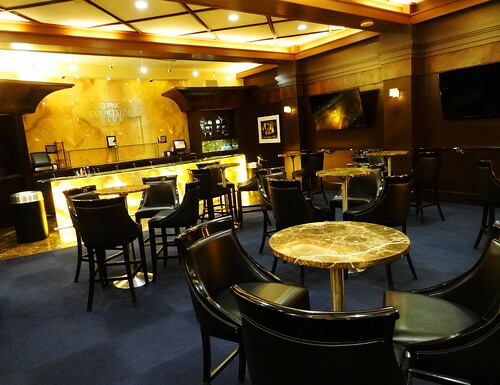 The PNC Courtside Club is luxe; lots of chrome and marble, button and tuck banquette seating. Hot food is served to courtside-seat-holders before the game, cocktails, dessert at half time, not a bad gig. In the studio I recognize the backdrop where coach VanGundy fields questions from reporters, another area is used for recording interviews, it’s all so familiar from seeing it on television. Moving along we check out the suites, they’ve all been renovated with wood floors and contemporary furnishings, kind of reminds me of a hotel room; the view is awesome. 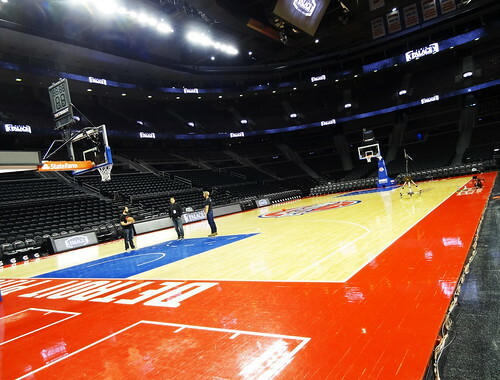 The Palace was considered the first of the modern-style NBA arenas, with multiple tiers of luxury suites it set the standard for every arena built after it. We’re having a very late lunch at Lockhart’s BBQ in Lake Orion, the sign on Lapeer Rd (M-24) tells us we’re 6 miles away. We arrive at the charming red-brick building in time for Happy Hour. The restaurant is named after Lockhart TX, the bbq capital. 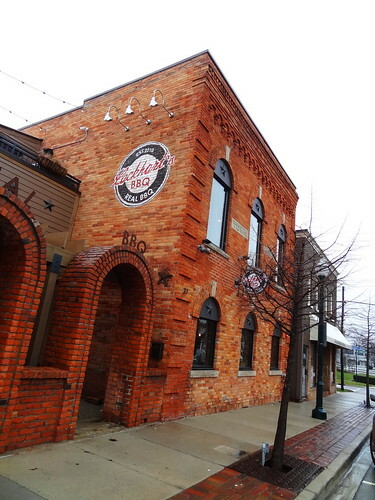 Here in Michigan the owners have come up with their own unique blend of Detroit and Texas resulting in superior flavor and tenderness. We sip on $3 cocktails and beer, indulge in the complimentary jar of pickled cucumbers, carrots, and onions as our food is prepared. The #3 sandwich is set before us, it’s so tall I’m not sure if I can bite it…. 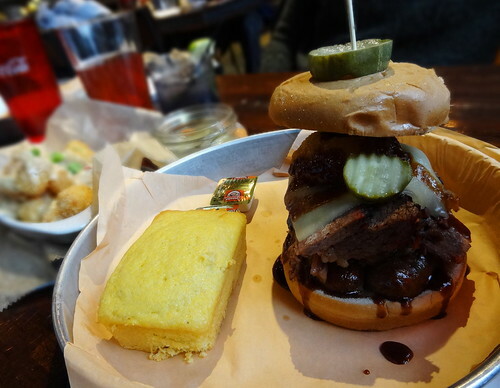 loaded with sliced brisket, sliced red-hot link, fried onion rings, dill pickles, white cheddar and bbq sauce on a homemade bun, I find a way to get the perfect bite. It’s absolutely delicious, a great combo of flavors and textures. The cornbread is top-notch, moist and tender, served warm. The side of tater tots drenched in queso, sprinkled with green onions makes a nice companion to the sandwich. I’m glad we came here. It’s been a good day filled with old, familiar things and new experiences. It’s going to be a big hit to Auburn Hills. Wonder what’s next for the palace? I suppose more concerts. I will have to ask Gina if she’s ever been to that restaurant. We just ate lunch in Lake Orion at a little diner there. They have concerts scheduled into September, after that it’s anybody’s guess. The land is very valuable so I don’t imagine it would be vacant for long if they demo the Palace. 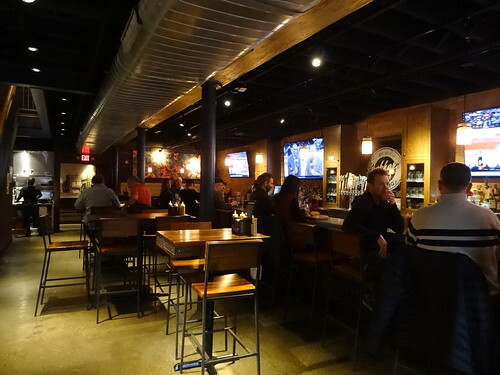 Definitely eat at Lockhart’s, it’s awesome! Many fond memories. Lots of games, concerts and dance competitions. Thanks for reminding me of those great memories. You showed me things I never knew where there.